"The Amazing Organic Fertilizer That Grows Tomatoes Like Crazy"
If you'd like to grow delicious, juicy and all natural organic tomatoes, then this might be the most important letter you'll ever read. Your organic tomatoes will grow like crazy with our organic tomato fertilizer or double your money back. "The plants are so large and heavily laden with fruit, a scaffold had to be put in place to hold them up." Reason one: Thousands of satisfied customers growing their best tomatoes and more of them, every season, year over year with our certified organic tomato fertilizer. Reason two: Independent tests show average improvements in tomato yield are 51% with improved tomato quality and fewer incidents of blight, blossom end rot, and pest infestations. Reason three: University studies along with large and small scale internal studies on gardners and farmers document teriffic results with organic tomato fertilizer. Your perfect year of tomato production, fruit size, taste, and yield, just got blown away by the enemy! The enemy shows up in many different forms. Wilts, early blight, late blight, blossom-end rot, cracking, catfacing, hornworms, and root-knot nematodes. There are very specific actions and defenses to counter the enemy of your tomatoes but number one on the list is healthy organic methods. Your tomatoes start to eat right when you spray it on. Our special formulation works as both a soil fertilizer and a foliar feed for your tomato plants. As soon as a drop lands on the leaves of your tomato plants their nutrient starved leaves will devour the natural plant food. You save money using our proven organic tomato fertilizer. You're wasting money right now on other fertilizers that are turning into toxic run off and throwing your soil chemistry and biology out of balance. This causes more problem than it fixes and hurts your tomato plants and garden in the long run. Your gardens are healthier and produce more tomatoes for less money than other fertilizers. 5) Fish and Kelp formulation is well rounded, proprietary, and very robust. Our unique formulation is multi-purpose, you can spray it on virtually every type of tomato plant that you raise. You can even use it on your entire garden and flower beds to grow more vibrant, healthy, and productive plants. Less watering and less worry whether your tomato plants are going to survive the long 4th of July weekend without you there. 7) Contains liquid kelp from the cold waters off the Atlantic coast of Canada with more than 60 naturally occurring major and minor nutrients. You probably already know this but kelp is natures gift to tomato gardeners giving your plants increased tolerance to disease by strengthening the cell walls and improving nutrient absorption. Imagine big, prolific, healthy, delicious tomatoes. Just picture how your tomato plants and garden soil eat this up. As you spray the light organic mist on your tomatos it is absorbed gently through the leaves and completely into the soil. You don't get run off the next time it rains. The organic tomato fertilizer nutrients bind in the soil so your hard earned money will get you results using a tested and proven liquid organic tomato fertilizer. Now, you're probably wondering how and why we can do all those things. Our liquid organic tomato fertilizer provides the missing pieces to your soil and ignites a firestorm of beneficial microbial activity causing your tomato plants to grow strong and produce more delicious, superior, organic fruits. And you begin to notice a liquid organic tomato fertilizer that is a proprietary, highly guarded, all natural fish and kelp formulation. Years ago we discovered a fish with unique properties that cause your tomato plants and gardens to flourish. We use the same fish sources year in and year out because of the proven results for your garden by keeping the core of our secret formula absolutely consistent. Have you ever had one great year then another horrible year? You look at the weather logs and you can't figure out what was different. You did everything the same and got different results. Beware, not all fertilzers use consistent sources and blends of ingredients like we do! For the same reason we use the same kelp sources year in and year out because years of research and testing have created the formula that is tested and proven. We spend the money to make the best possible all natural organic tomato fertilizer available for prolific healthy results on your tomatoes. It is a liquid formulation so it is applied using your garden hose, mixing it in a watering can, or if you are growing acres of tomatoes use a boom spray set up behind your tractor. "...normally I don't have any ripe tomatoes until at least the last week of July or the first week of August. Today is June 24: I've been eating cherry tomatoes from my vines, and I have more tomatoes, more fully developed than any I've ever been able to grow before. I have changed nothing in the method I've used to raise these tomatoes other than to use your Organic Tomato Fertilizer." "...I fertilized half of the garden with your Organic Tomato Fertilizer and the other half with my regular commercial fertilizer. The results were absolutely amazing. Green pepper plants which usually would bear three or four peppers per plant were producing as many as eight and nine peppers per plant and had increased the size of the fruit by at least one-third. The tomato plants which normally would grow to a height of 3 to 4 feet were up over 6 feet, had bushed out double their normal size, and then produced at least twice as many tomatoes as the non-Natural Fertilzer fertilized plants with large and better fruit on top of it." "...worked with a Washington, D.C. gardener who conducted an experiment with three tomato plants. One received no fertilizer, one got Miracle Gro and one was given our Organic Tomato Fertilizer. The plant that received no fertilizer was 3 feet tall. The plant that got Miracle Gro was a little taller. The plant that received your Natural Fertilizer was over 4 feet tall. The plant was full of leaves and fruit production was greatly increased." 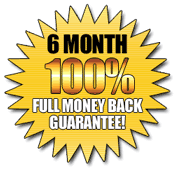 1) You must have a reliable and tested organic formulation with a proven track record for at least 10 years. 2) You must have strict quality control to assure your formula is contaminant free and contains only the exact ingredients to provide huge healthy plant growth. 3) The natural formula must have the correct selection of natural ingredients to promote early ripening, improve quality, and extend the shelf life of tomatoes. 4) Your natural organic tomato fertilizer must absolutely be "organic" no questions and no tricks. It needs to be tested and certified. 5) Your fertilizer must have specific natural plant hormones that dramatically increase tolerance to heat, to cold, drought, and pests. Listen up, you showed up here because you want to improve the results you get from your tomato plants (and probably elsewhere in the garden too). The reality is there are number of very simple things to do, that together, produce excellent tomatoes. ...we offer natural organic tomato fertilizer designed and blended for your tomatoes... not manure and not just ground up fish. When you look at the results, lots of healthy delicious ripe tomatoes, the fertilizer we provide is often worth virtually 10 times what you get from other products... and it generally costs less than others per application. You get all natural liquid organic tomato fertilizer in our super concentrated form, supplied in a 1/2 gallon amount, split into 2 quart size bottles sized for convenience and ease of application. Our fertilizer is certified organic. If you respond right away, you pay only $49.99 $29.97. We have been able to reduce the price for you because we are offering this factory direct. This is not available in stores. A simple step by step comprehensive guide on how to use natural organic fertilizer, how much to apply, and how to apply it. 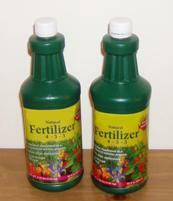 You will know exactly how to grow healthy strong plants with a natural organic tomato fertilizer. The revealing report "Easy Steps to Natural Lawn Care" that reveals the secrets to organic lawn care success. When you see the positive results on your tomatoes you begin to understand that organic is the way to go and this report will help you take your organic ambition successfully to the next level. Our unique hose end sprayer attachment simply connects directly to our organic tomato fertilizer bottles. As long as you have a hose and a water source this enables you to put your fertilizer with ease. Simple and clean. Click the button below now for secure processing.